From newcomers to up-and-comers, an array of golfers could take the world by storm this year. Former Europe Ryder Cup captain and Golf Care ambassador Bernard Gallacher gives us his golfers to watch in 2019. Cameron is such a long and straight hitter. Over the last few years, Rory McIlroy has consistently finished top of the driving stats for the PGA Tour, but Cameron has taken it to another level with his mighty 350-yard drives. He’s hitting it 30 yards past Rory! Length is everything on the PGA Tour – the courses are set up so that spectators can enjoy big hitting and they don’t try and restrict driving. This aspect of Cameron’s game will always keep him in contention and the more he’s in contention, the better chance he has of winning tournaments. The courses in the desert are probably most suited to Cameron’s game because they’re such perfect conditions and are wide open off the tee. Danny’s been in the doldrums since winning the Masters in 2016. He had a terrible Ryder Cup at Hazeltine and his confidence was very low for a while. Since he’s changed coaches and started working with Sean Foley, who has worked with Justin Rose and Tiger Woods, you’d have to say it’s paid dividends for him. He put on a blistering finish to win the DP World Tour Championship in Dubai, when he was under a lot of pressure. I think Danny’s turned a corner with his game, so I’d expect him to win a few tournaments this year and compete in a few of the Majors. Eddie had a successful 2018. He played well at Carnoustie and his joint sixth-place finish was a great achievement. At 27, he’s taken a while to get to his current level, considering he’s been a professional for six years, but he finally appears to be realising his potential. Finishing sixth at the Open set him up perfectly for his end-of-season victory in the British Masters at Walton Heath. It was a very tough course and the conditions were difficult, but he had a very impressive week. I’d expect him to push on now and his game gives him a great chance against even the best golfers. He’s long off the tee, he keeps it straight and he’s a good putter, so I’m looking forward to seeing more of him this year. Luke is a perennial underachiever, considering how talented he is. He’s one of the biggest hitters on the PGA Tour and he’s constantly up there beside the big boys. However, he’s at an age now where he needs more consistency in his game. He’s got all the ability to succeed on the PGA Tour and he came very close to finally taking home his first PGA title in 2018. We saw this in the Honda Classic when he narrowly lost to Justin Thomas in a play-off, which is no embarrassment. If he can be more consistent, he’ll be one of the golfers to watch in 2019. Jordan’s got a very good technique. I watched him win the Porsche European Open in 2017 and he looked very comfortable in the play-off against Alexander Levy. He’s achieved some strong results since, including a joint-third finish at the British Masters and a T12 finish at the DP World Tour Championships. He’s 26, so he’s got time on his side, and he’s got a good temperament from his experience on the Challenge Tour. I think he’s now ready to take his game to the next level. Belgium has produced some talented golfers in recent years, including Nicolas Colsaerts, and Thomas Detry seems to have followed suit. He put on a fine performance at the World Cup of Golf with Thomas Pieters. He was playing with a strong partner in Pieters, but he didn’t let him down and they won a lot of money as a result of their victory. He’s got a fine amateur record and a great record on the Challenge Tour, so I think he’s ready to perform at a high level. Like some of the other golfers I’ve selected, he’s a very good age at 26, and I’m expecting him to become a winner on the European Tour in 2019. Xander burst onto the scene a couple of years ago in his first season on the PGA Tour and he’s gone from strength to strength since. He’s won the Tour Championship, finished T2 at last year’s Open, T2 at The Players Championship and T5 at Shinnecock. His season’s already off to a flyer with his victory at the Tournament of Champions in Hawaii, where he shot a final round 62 after coming from behind. When you look at the players who finished behind him – Rory McIlroy, Dustin Johnson, Justin Thomas – these are all guys that have won major tournaments, which shows that Xander can compete with the very best. He’s not afraid to win, he’s mentally very strong and he’s a straight hitter. Of all the guys I’ve picked, I’d say he’s got the biggest chance of winning a Major in 2019. Aaron’s a young golfer at only 22 years old and he’s got a very bright future ahead of him. Last year, he won the PGA Tour Rookie of the Year, like Xander Schaufelle before him, which has put him in an exclusive club of golfers. Anyone who receives this accolade is destined for big things. Only Tiger Woods, Jordan Speith, Sergio Garcia and Kim Si-Woo have made the Tour Championship at a younger age than him, so he’s obviously got a good pedigree. If he runs into form, there’s no reason he can’t spring a surprise and win a Major. At the same time, it’s important he doesn’t set his standards too high and disappoint himself. Haotong already has two European Tour wins to his name and is up there with the elite pool of golfers. He nearly beat Justin Rose at the Turkish Airlines Open and he finished with a 63 at Royal Birkdale in 2017 and even had an outside chance of winning the Open. Of all the Asian golfers around, he’s the one player who could win a Major this year. He’s shown he has the mentality for the big occasion. China as a nation is catching up fast in terms of producing good-quality golfers. They’re not just stuck in China anymore, they get out there and travel and they want to learn. Haotong Li embodies all of this and he’s someone I’m really looking forward to seeing more of this year. Webb Simpson won the US Open in 2012, but his career stalled when the belly putter was banned in 2016. He’s had to rebuild his putting method and it’s been a very difficult time for him, but he’s had a real renaissance recently. He won The Players Championship at Sawgrass in impressive fashion, and anyone who watched the Ryder Cup closely would tell you that he was the outstanding player for the USA. He’s got a lot of confidence on the greens and a good temperament, so there are definitely more wins on the way for him. I’ve always admired David Law as a golfer. He’s won the Northern Open as both an amateur and professional, which is a notable achievement. 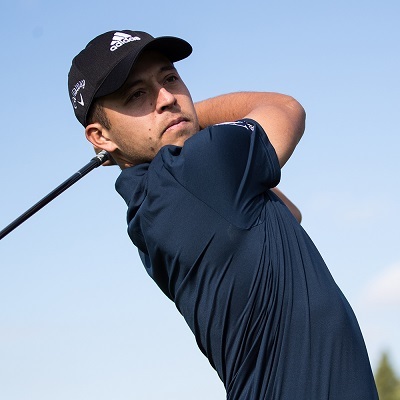 It hasn’t really happened for him so far as a professional, but last year he persevered on the Challenge Tour, got into the top 15 and got his card. I’m really expecting him to kick on now and he’s got a real advantage working with Paul Lawrie. Paul’s given David a lot of help on his game and, like me, he really sees the potential in him. If he picks his schedule carefully, he has a good chance of succeeding.